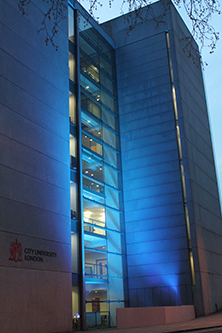 Last night City University London's College Building and Social Science Building were lit up with blue lights to show support for World Autism Awareness Day. The #CityInBlue campaign was led by the Autism Research Group at City. Professor Dermot Bowler, head of The Autism Research Group, said: "It is fantastic to see the buildings lit up in blue for World Autism Awareness Day. Raising awareness of autism is key to all the work the group does here at City. Our research has led to important discoveries in understanding people with autism and how we can help improve their quality of life." 2nd April 2014 was the seventh annual World Autism Awareness Day since the day was designated by the United Nations General Assembly in 2007. Find out more about the work of City's Autism Research Group (ARG). In the video below, City PhD student Esha Massand talks about researching memory in autism and Niki Daniel outlines her work into how people with autism recognise faces.